It seems like it is not possible to buy anything anymore without receiving a request to fill out a customer service survey. After purchasing a laptop computer recently, we even received a separate phone call asking about our satisfaction for each individual component and peripheral device (there were 6 or 7). The process was just too long, with too many pop-ups after purchase, too many "special offers" on receipts, too many requests to stay on the line for a short survey and a bunch of other junk. We pretty much ignored all survey requests and we know we are not alone. It begs the question--how valid are survey results if only a few people fill them out? Banks are constantly seeking more information about customer satisfaction. This makes sense because more technology also means banks don't see their customers as much as they used to. These days, most customer interaction takes place through internet banking, mobile access, ATMs and other non-personal channels. Remember when you worried customers in drive-up lanes might be too remote in terms of communication? Those were the good old days compared to the low level of face-to-face interaction we have now. 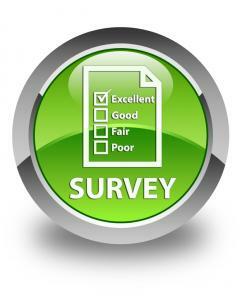 That said, surveys do add some value, so we share some guides for creating a good one. Focus on narrative, have check boxes but also have open-ended questions, be sure questions are neutral and not leading, make your survey real time, reach out and follow up (especially if someone offers suggestions) and finally, share the results around the bank. This not only includes frontline staff, but everyone else too. A good survey is terrific, but still, if fewer and fewer people respond, does the information matter? To better understand, we looked at SurveyMonkey research. This company helps its clients gather more than 2mm surveys a day or billions per year. Even it finds 80% of customers who actually make the effort to do a survey abandon it halfway through. Further, 52% won't spend more than 3 minutes on any survey and 72% say a survey pop-up interferes with the experience of a website. In the end, survey response rates have dropped from around 20% twenty years ago, to around 2% today. Like many things that have not adapted to a rapidly changing world, the customer service survey may progress from a valid means of gathering data, to customer irritant to non-existent. Perhaps that is why interest in data analytics has surged. For example, after logging into a data analysis site we hadn't used in a while, we received an instant email saying, "Welcome back--let us know if we can help you find anything." This felt appropriately targeted, so it didn't bother us at all. Clearly you don't want to do this every time someone logs in to your site, but it seems like a reasonable way to go to try and engage with customers. There is a ton of data out there and buckets of it do not require the customer to act. Maybe it is time to explore ways your bank can use the information it already has, like where customers shop, where they transfer money, whether they have kids in college and whether they own a business. All this information tells us something the customer may need, and it delivers the bank a more meaningful communication path with the customer. Personalized and meaningful are what community banking is all about, so keep exploring ways your bank can better understand customers as you provide awesome service at every juncture. Jobs data came in stronger than expected, increasing the likelihood of a December rate hike and causing a 9bps surge in Treasury yields. 1) Seacoast National Bank ($3.2B, FL) will acquire Floridian Bank ($453mm, FL) for about $76.5mm in cash (35%) and stock (65%) or roughly 1.4x tangible book. 2) Bank of America will sell its $87B cash management money market mutual fund business to BlackRock for an undisclosed sum. 3) Chippewa Valley Bank ($297mm, WI) will acquire State Bank of Drummond ($44mm, WI) for an undisclosed sum. 4) Citizens National Bank ($885mm, TN) will acquire National Bank of Tennessee ($143mm, TN) for an undisclosed sum after National's holding company files for bankruptcy. 5) Ameris Bank ($5.2B, GA) will acquire Merchants and Southern Banks ($473mm, FL) for about $50mm in cash. 6) Wellington State Bank ($241mm, TX) will acquire Security State Bank ($118mm, TX) for an undisclosed sum. 1) Ameris Bank ($5.2B, GA) will acquire 18 GA and FL branches from Bank of America for an undisclosed sum. The branches have about $812mm in deposits. 2) HomeTrust Bank ($2.8B, NC) will close 6 NC and TN branches as it adjusts to increased customer usage of online and mobile technology. 3) Incommons Bank ($117mm, TX) will purchase 2 TX branches from Allegiance Bank Texas ($2.0B, TX) for an undisclosed sum. The branches have $27mm in loans and $30mm in deposits. JPMorgan and Wells Fargo have cut off financial aggregation web sites like Mint and others, in a move to reduce competition and better protect customer data. Bankers focused on the risk of rising interest rates on the cost of deposits should note a more structural factor is also in play. A big push by regulators pushing banks to find more core funding sources is leading foreign banks to pay higher rates for US deposits, according to the Wall Street Journal. Not sure how you model this, but keep your eyes and ears open to local market changes to stay on top of this new and more expensive funding trend. Quartz reports ride sharing company Uber is reportedly planning to offer banking services to its drivers.